Genesis -- with Anne Graham Lotz, daughter of evangelist Billy Graham and well-known writer and speaker. Exodus -- with Joseph Steinberg of Jews for Jesus. Selected Psalms -- with Stephen Lungu, a former gangster who now heads up African Enterprise in Malawi. Jonah -- with George Verwer, founder and former International Coordinator of Operation Mobilization. John -- with Anne Graham Lotz, daughter of evangelist Billy Graham and well-known writer and speaker. Philippians -- with Joni Eareckson Tada. A quadriplegic since 1967, she is founder of Joni and Friends. I, II Thessalonians -- with Rico Tice, Associate Minister (Evangelism) of All Souls Church. II Timothy -- with Vaughn Roberts, rector of St. Ebbe's Church in Oxford and a writer and popular speaker. I Peter -- with Don Carson, Professor of New Testament at Trinity Evangelical Divinity School in Illinois. Esther -- with Ruth Chan, ?a former full-time church worker in the UK Chinese community. II Corinthians -- with ?Dr. K. P. Yohannan, Director of Gospel for Asia and author of more than 200 books. James -- with Robbie Langford, a recently retired missionary of ?30 years who had served in South America, Central Asia, and Sudan. Acts -- with George Verwer, founder and former International Director of Operation Mobilization. Daniel -- with Stephen Nichols, from London. He previously taught college history in south China and worked with international students at All Souls Church, London. He currently serves as a curate in Plymouth. Joshua -- with Sami Dagher, a pastor and president of the National Evangelical Christian and Missionary Alliance Church in Lebanon and founder of the Christian Alliance Institute of Theology in Beirut. Galatians -- with International Speaker and Author Joni Eareckson Tada is the founder of Joni and Friends, an organization which exists to communicate the gospel and equip Christ-honoring churches worldwide to minister to people affected by disability physically, emotionally and spiritually. Ephesians -- with International Speaker and Author Joni Eareckson Tada is the founder of Joni and Friends, an organization which exists to communicate the gospel and equip Christ-honoring churches worldwide to minister to people affected by disability physically, emotionally and spiritually. Isaiah -- the birth, life, death, resurrection, ascension and return of the Lord Jesus Christ. 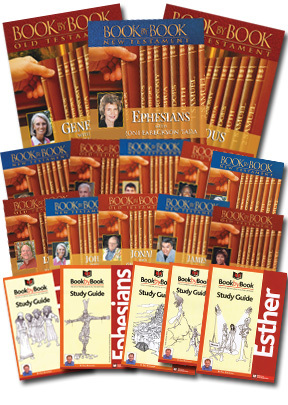 NOTE: One study guide is included with each DVD - Leviticus is a PDF guide only!